This post brought to you by Immortalized On AMC. All opinions are 100% mine. Whatever you think you know about taxidermy be prepared to change your mind. Whether taxidermy makes you think of Bambi’s mom and dad hanging on a wall watching you with that creepy blank stare or the Wikipedia definition “Taxidermy is the art of preparing, stuffing, and mounting the skins of animals (especially vertebrates) for display (e.g. as hunting trophies) or for other sources of study.” it doesn’t apply to “Immortalized”. AMC’s new show “Immortalized” incorporates art into the mix challenging viewers and participants to look at taxidermy a whole new way. 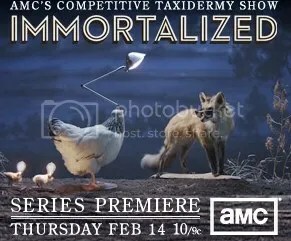 “Immortalized” which Thursdays at 10pm EST/9pm CST on AMC is an unscripted competition between the top taxidermists. I watched “Immortalized: End of the World” (Pre-Air Premiere) Season 1, Episode 2 online. Like any good competition “Immortialized” starts with trash-talking rivals who had “butted heads” before in taxidermy competitions. Their job is to work the night’s theme which was The End of The World into their piece. The cardinal rule is “no endangered species.” The show follows the competitors back to their studios as they make their exhibit. Don’t be worried, you won’t see the death of any animals. If you are like me, you have never seen a taxidermist work. You will be surprised at the artistic ability needed to put a piece together. The artist sculpts a base of the animal that is very complex and realistic. What you think would be gross and kind of icky, isn’t at all. It is like any other art competition. The judges are looking for more than just predator and prey but what the piece says metaphorically about the night’s theme. Immortalizers (L-R top) Takeshi Yamada, Beth Beverly and (L-R Bottom) Page Nethercutt, Dave Houser meet challengers Thursdays at 10pm EST/9pm CST on AMC. AMC’s unscripted series brings viewers into the captivating and provocative world of creative and competitive taxidermy. Immortalized explores the passionate detail and artistic expression that goes into creating this compelling art. Each episode will feature one of four highly regarded “Immortalizers” facing off against a “Challenger” in a competition. Their task is to create a piece to be judged on three criteria; originality, craftsmanship and interpretation of the designated theme. Whether the artists are known for their classic or rogue creations, each week they will work to perfect this centuries-old art form in an unprecedented battle. AMC has a much appreciated closed caption option for their online broadcasts. If you have trouble viewing the show online in Mozilla switch to Internet Explorer.